Computer games aren't just games anymore, they're learning experiences. Jeff Ferzoco reports in Planning Practice. Excerpts from Reconsidering Jane Jacobs, a new Planners Press book edited by Max Page and Timothy Mennel. Jonathan Barnett defines them all. What Cairo's Al Tahrir Square teaches us about the organization of public space. By Nathan Cherry. Under fire in Florida and California. Statistics in the news — compiled by APA's Research Department. This month: outreach tools. Reid Ewing describes a new way to predict the traffic generated by mixed use development. Wants and needs, sprawl solutions. A new message for difficult times. 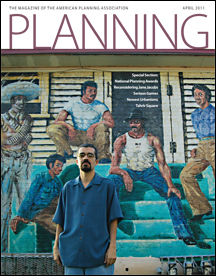 Cover art: Alvaro Huerta, recipient of the 2011 National Planning Achievement Award for Advancing Diversity and Social Change. Photo by Pablo Aguilar.